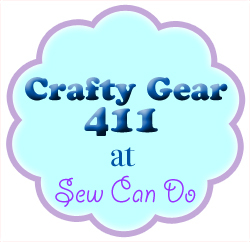 Sew Can Do: A New Series: Crafty Gear 411! A New Series: Crafty Gear 411! Since I started sewing a few years ago I've discovered various tools & techniques that have really become my "go-to gear" for making all sorts of things. These are the items I use time and time again, that have helped upgrade my sewing skills and make my final results more rewarding. I'm launching a new series here at Sew Can Do to share some of my "sewing room secrets" and give some real person experience with them so you can see if they might make your sewing adventures more enjoyable. I'm calling it Crafty Gear 411: Tools & Tricks for Super Sewing. Sometimes I'll share a particular tool or notion I find really useful, other times just a shortcut or way of working that seems to make sewing easier. I've got a number of things on my list, but I'd love to get some ideas from you crafty folks on what you're curious about. - Was there a particular tool you've seen here that you want more details on? - A project shown that used a technique you want to learn more about? - A tool you've heard about but is still somewhat mysterious to you? I'd love to find out what kinds of things you want to know more about, so let me know and I'll see what I can add to the upcoming Crafty Gear 411 list! I did a tutorial on how to use a silhouette SD to cut fondant and gumpaste! nice addition to all the other amazing things you can DO with a silhouette! I'm going to have to keep an eye out for this series, only yesterday I was thinking I couldn't live with out that funny little thing that helps measure hems / seams accurately! I only got it yesterday, and whilst sewing a tote couldn't believe how I had done anything without it. Wonder what else I'm missing out on! I'm excited for this series!! Can't wait to see what you have in store!